While getting his degree in neuroscience, Dr. Michael Jiang was inspired to help his peers manage their anxiety. While getting his degree in neuroscience, Dr. Michael Jiang noticed that a lot of his friends—especially fellow students—were struggling with the stresses of everyday life, and looking for a solution to their anxiety. But with no solution at hand, and a desire to help the people around him, Jiang decided to leverage his scientific background to create an easily accessible product that could help relieve stress. Joining forces with CEO & Co-founder Holly Ash and Co-COO & Co-founder Graeme Warring, Jiang created Nerv. Learn how this RangeMe Verified™ brand was able to expand their presence in the retail market while revolutionizing the wellness supplement and lifestyle space. As a neuroscience student, Jiang noticed that rarely did his peers veer from science; few branched out to pursue careers in business or entrepreneurship. Jiang, however, decided to take a different path. “I was getting my degree and I thought, ‘Hey, I could use this knowledge to try and create something that could help the people around me,’” he explains. He decided to create a consumer product that could help people de-stress and focus, and would be easily accessible over the counter without a prescription. Knowing there was no other beverage like Nerv in the marketplace, Jiang was confident that his product would be popular and well-received. Using his scientific knowledge, Jiang made what he considers to be an “anti-energy drink.” With its unique “Pherelax™ blend, a mix of ingredients designed to tame overactive neurons, Nerv is intended to relieve stress, improve focus and—a wink to its name—help calm nerves. Knowing he’d created a stellar product, Jiang posted Nerv on Indiegogo, a popular crowdsourcing platform, to generate funds and interest. Within six days, Nerv was funded, and the team was able to start manufacturing the product with the goal of landing in retail stores. Nerv had success landing in a number of retailers on their own, but they wanted to pursue all options available to ensure they had as much visibility as possible. To increase that visibility, they signed up for RangeMe and took the extra step to get Verified. “We chose RangeMe because it seemed like a powerful platform that would give us wider exposure to many buyers at once,” Jiang explains. And that’s exactly what happened for Nerv. 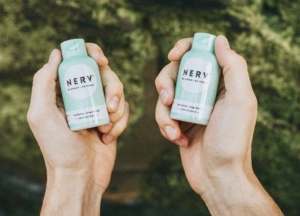 Nerv is currently stocked in more than 80 CVS Pharmacy locations, and they are also working on doing promotions with CVS to further boost sales. The team hopes to expand upon this partnership in the future. The Nerv team is excited to keep landing new retailer placements while expanding upon their sales strategy and gaining new customers in creative ways. Because Nerv started out on a college campus, the team focuses a lot of their sales and marketing efforts on student brand ambassadors. 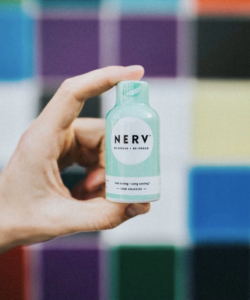 This approach has offered a lot of organic growth potential for Nerv, and the team is excited to keep growing to new campuses to spread the word about Nerv and continue their mission of helping people—especially busy students—manage their stress.